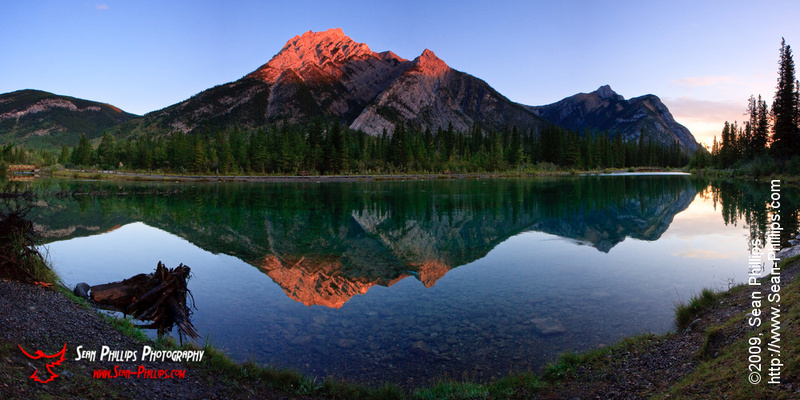 I waited for a long time after the sun rose so that I could make this image of Mount Lorette reflected in the Lorette Ponds in Kananaskis Provincial Park. And I almost didn’t get the shot! I really wanted to catch the Alpenglow on the peak of Mount Lorette, and in the reflection in the water, but it didn’t happen with the initial sunrise. The morning glow on the face of the mountain came as sun rose over the horizon on the prairies, but then faded as the sun climbed. It wasn’t until the sun actually rose up above the mountain peaks immediately to the east of me that the Alpenglow began! I love how the mountains light up in a magnificent red glow at times like these! Fortunately I made a series of images very quickly because it was only a minute or so after this that a large flock of ducks flew in and landed on the pond in front of me, destroying the glassy smooth finish on the surface. The Alpenglow was over before the pond was calm again. But I got the image I wanted! !